Many companies, especially companies with recent M&A activity, have an overabundance of applications, customer databases and tools that don’t play well together. They can’t use their data effectively, innovation suffers, and they become vulnerable to disruption. The problem is exacerbated by the rise of new data privacy laws like GDPR and ever-increasing security risks. The PrivOps Matrix™ is not intended to replace systems of record, systems of intelligence or systems of engagement inside and outside the organization, but rather to harmonize them. By integrating, governing and automating data flows between these systems, the PrivOps Matrix™ serves as the foundation for a business technology platform. With the PrivOps Matrix™, organizations can securely and compliantly monetize data by controlling in real time where sensitive data lives, how it’s stored, and when, who or what has access. Safely using data to make better, faster decisions, create more personalized customer experiences, and enable new business models is how companies in the 21st century compete and win. Acquisitions, departmental technology decisions, aging technologies, and new cloud based applications and tools have created a proliferation of different applications, databases, interfaces, and tool across most organizations. Because the pieces don't fit well together, innovation, security and data protection are difficult to achieve. Traditional and cloud software companies make the integration problem worse by creating proprietary technology stacks to lock customers in. To solve the complexity problem, we need a broader way to think about data. By creating modularity at the data, policy and application layers, it's possible to create reuse patterns that dramatically improve the ability to build, deploy and manage applications and data. Modern IT architectural patterns like serverless compute, API standardization and DevOps have created substantial improvements in the ability to apply technology to innovation; the PrivOps Matrix™ builds on these concepts to accelerate innovation even further. metaDNA™: How The PrivOps Matrix™ optimizes data governance by codifying data like APIs codify interfaces. 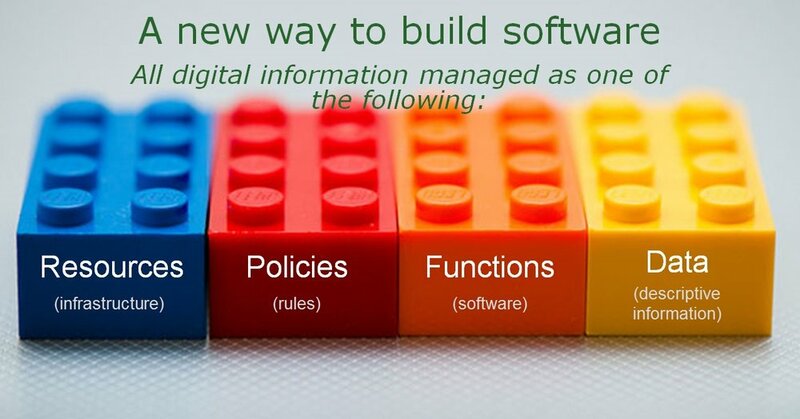 Four standard reusable data objects: policies, resources(devices), functions (software code), and data can be connected in almost any configuration to create new applications, integrate with existing applications & data and automate policy management & configuration changes - much like Legos. The Matrix™ has unlimited scalability, is highly resilient and secure, and connects to 1,000s of different APIs, cloud, traditional infrastructure, web service and/or traditional software. Copyright 2019 PrivOps, LLC All rights reserved.